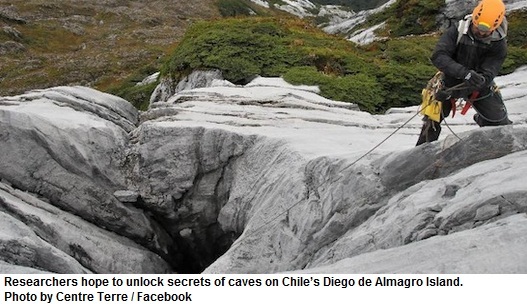 Chilean and French scientists have discovered a network of underground caves on a remote island in Patagonia that could provide valuable clues as to how continents were formed. Scientists had to abseil and scubadive to get into the caves, some of which are around 65 feet deep. They found wall paintings and bone fragments left by the indigenous Kawesqar people that could help date the caves. “You can make models of areas where the continents broke off and this could be one of those spots,” said speleologist Natalia Morata. Video: Centre Terre is a non-profit association created in 1992 by both cavers or scientifists, eager to share their skills to carry out exploration work and whose common denominator is caving.